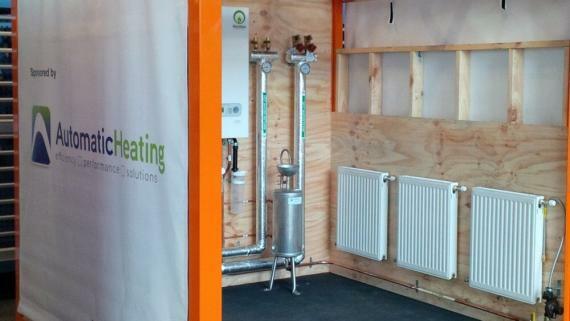 In previous articles we have considered the heating efficiency gains available through the use of condensing boiler technology and how these efficiencies are achieved. We have also looked at the way the lower temperature set points common to condensing boilers further enhances efficiency due to lower standing losses. 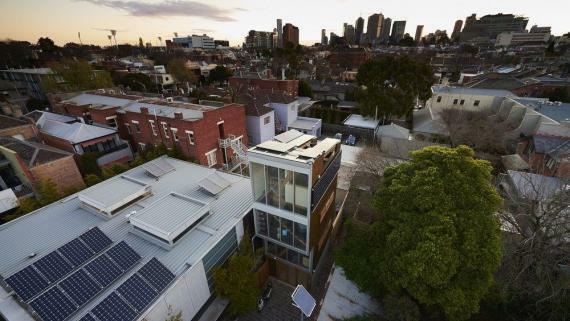 This is the third of a series of articles contributed by Dr Paul Bannister, a thought leader and public speaker on energy and energy efficiency issues in Australia. For other articles in this series, please refer to the links at the end of this article. 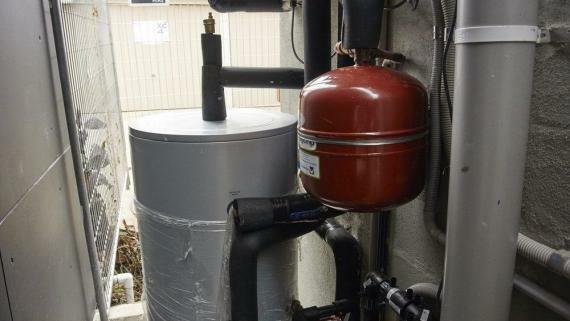 Typically, boilers are replaced like for like when replacing an existing boiler that has reached the end of its life. 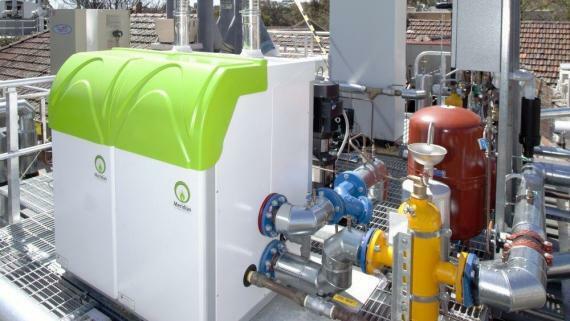 However, performance data shows that even though optimum performance of condensing boilers occurs at temperatures below 60°C, condensing boilers can still provide substantial energy efficiency benefits when retrofitted to a conventional 80°C flow/60°C return hot water system. 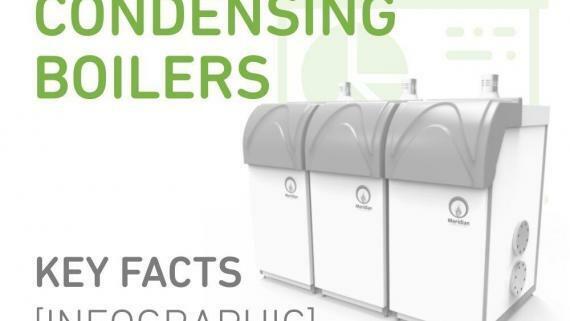 The major increases in efficiency are available in times when the heating load is less than the peak design value and can be achieved by varying the boiler operating temperatures from 80/60 at times of peak load to lower temperatures when heating loads are lower. This is quite simple to achieve using the on-board controls available on most condensing boilers, which permit the supply hot water temperature to be reset by an outside signal. 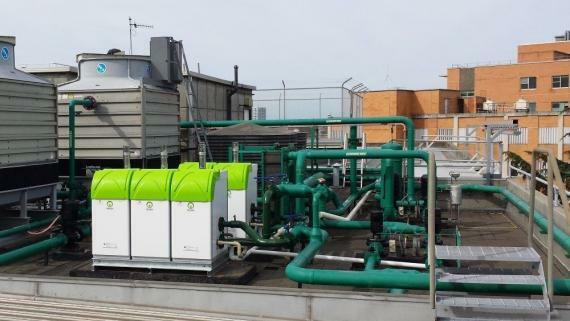 The total efficiency gain achieved is almost as good as if the system was being run at low temperature all the time. 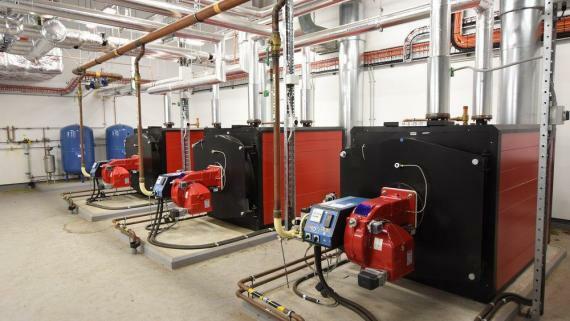 For the Seek building boiler upgrade at 541 St Kilda Rd, Melbourne, CBRE chose to replace the existing aging boiler with 5 x 157kW high efficiency Meridian Condensing Water Heaters. 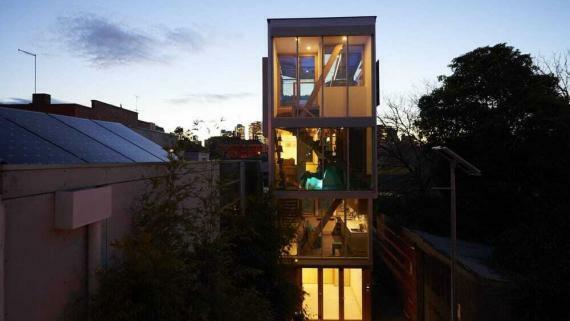 Meridian’s compact size allowed access via stairs to the roof, saving the cost of a crane lift. To understand how this is possible, it’s necessary to look at the heating load profile. 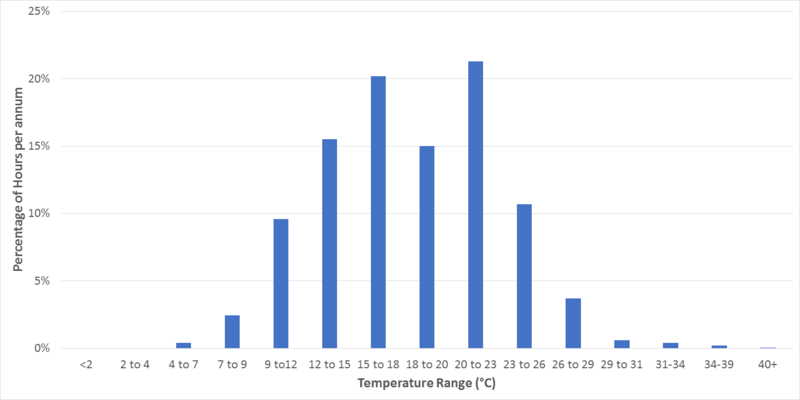 Figure 1 shows the annual temperatures for Sydney as a histogram. 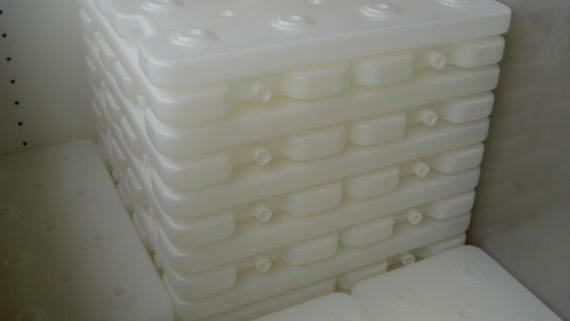 Given normal design temperatures, the heating hot water system will be sized to be at 100% capacity in the 4-7°C temperature bracket. However, this comprises only 0.4% of the hours in the year. Figure 1. Sydney temperatures as a histogram. Other centres will be similar, but displaced up or down the scale dependent on climate. 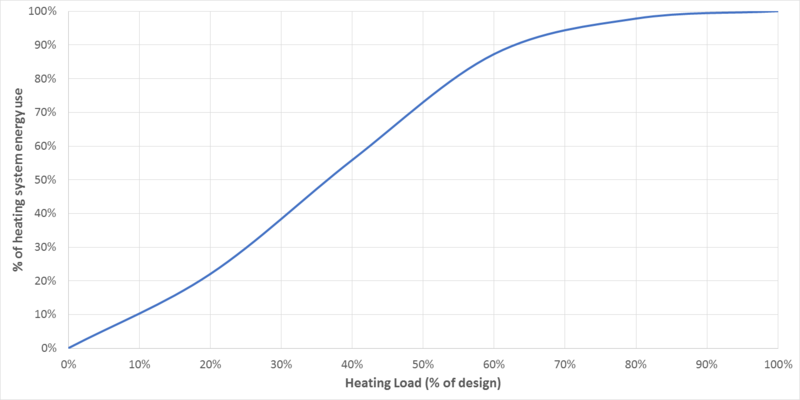 If we estimate that heating load decreases linearly from 100% in this temperature bracket to 0% by the time the temperature has reached 18°C, we can estimate the total energy consumption profile for the system, as shown in Figure 2. 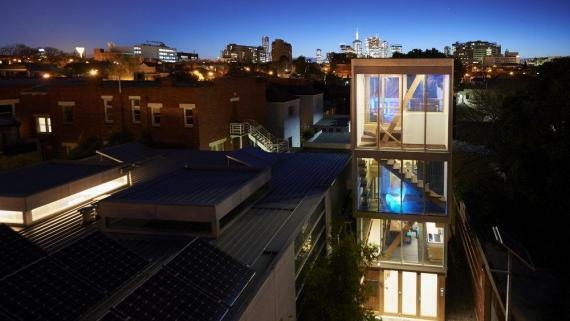 It’s pretty clear from this that the vast majority of the energy use occurs at less than 60% of design capacity. This is important, because it is only at the higher loads that the heating coils need the 80°C supply temperature they were originally designed for. 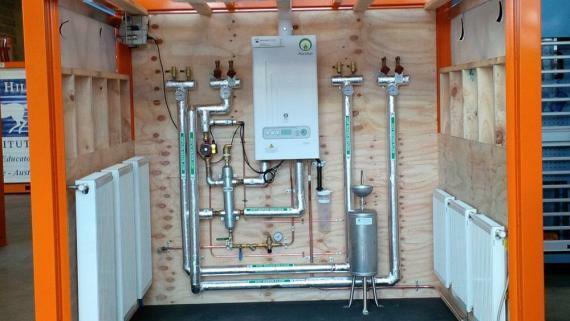 So it’s possible to set the temperature control to adjust supply hot water temperature to reflect system needs, and provide hot water at 80°C at peak loads while maximising condensing boiler efficiency benefits at lower loads – which comprise the vast majority of the time. 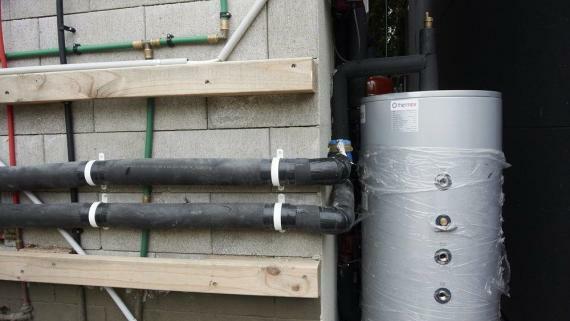 It’s important to remember as a starting point that even in non-condensing conditions (such as 60°C return hot water temperature), a condensing boiler will still provide an efficiency benefit of around 5% relative to a conventional boiler. This is because the additional heat exchanger area of the condensing boiler improves efficiency even when no condensing occurs. 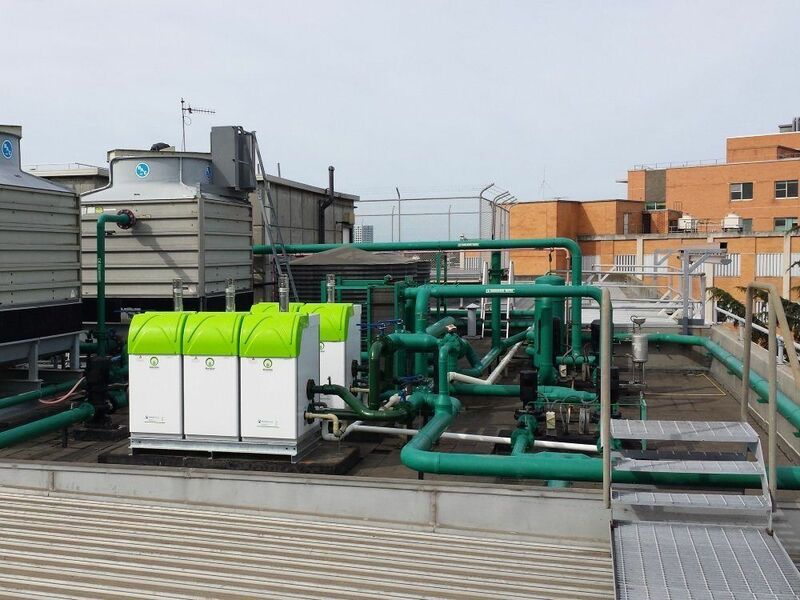 However, once we drop the return water temperature below 55°C, the condensing efficiency benefits kick in and we start seeing combustion efficiency impacts of 10% and better – as well as reduced distribution pipework thermal losses. Figure 4. 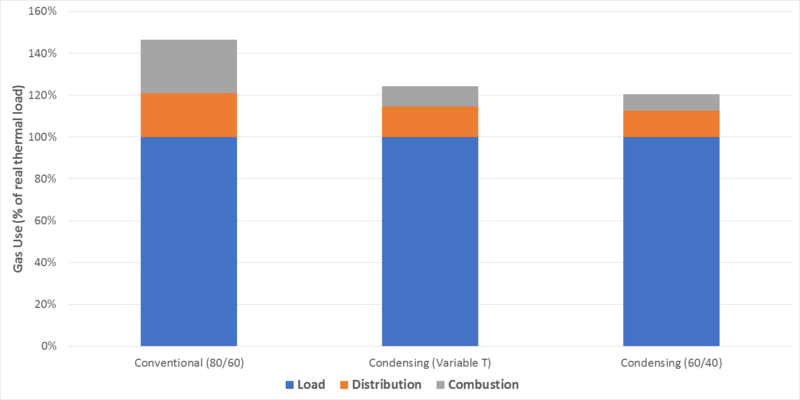 Full year efficiency for conventional, variable temperature condensing and fixed temperature boiler configurations based on the heat profile from Figure 2. The efficiency benefits are significant. 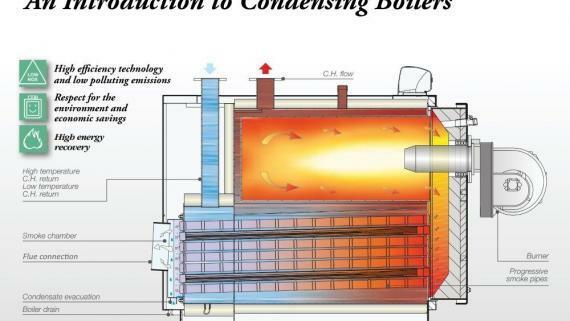 If we compare an 80/60°C conventional boiler system to an equivalent condensing boiler system operating on a variable temperature schedule (80°C at 4-7°C reducing to 60°C by 15-18°C) and a condensing boiler operating at fixed temperature (60°C supply, 40°C return) using the heat energy profile in Figure 2, we get the results shown in Figure 4. It can be seen that the variable temperature configuration achieves overall gas savings of 15% relative to the conventional boiler. This compares well with the fixed 60/40 condensing boiler, which achieves only marginally greater savings at 18%. The vast majority of the condensing boiler savings are retained in the variable temperature configuration. 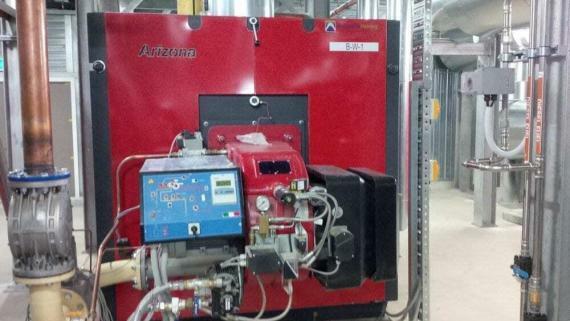 Condensing boilers are an ideal retrofit for an existing 80°C flow/60°C return system. 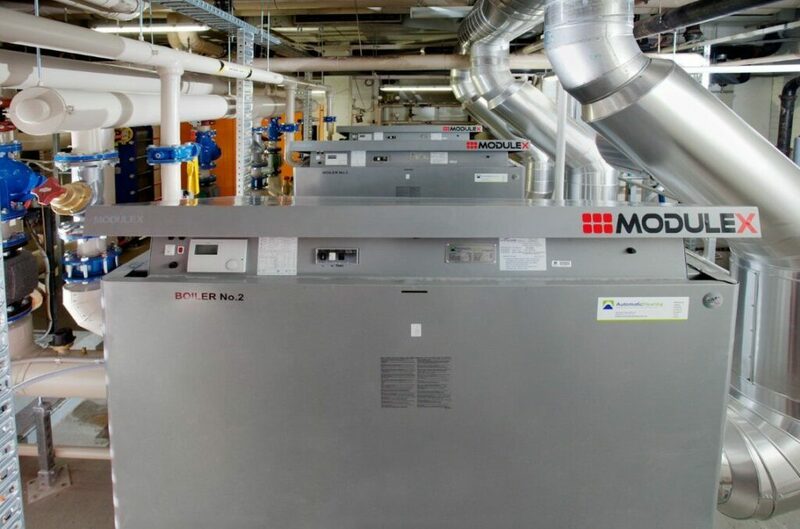 Modulation of the supply temperature, typically across the range 80°C-60°C across normal operating conditions, enables the system to serve the full system demands of the hot water system while still achieving the significant efficiency benefits of a condensing boiler system.